Everything that can go wrong, statistically speaking, has gone wrong. Claim that your model was right and the observation naught but “natural variations”? If you said (C), you should consider submitting your ploy to Nature; they’ll likely publish it. Just like they did the peer-reviewed “Forcing, feedback and internal variability in global temperature trends” by Jochem Marotzke and Piers M. Forster. I wept when I read that. Real tears. That sorry excuse is no different than you saying the sun’s departure from your prediction was due to “natural variability” and that any skeptics who point our your model is a bust were wrong. No. No. No. It is as simple and no more difficult than this. A climate model consistently says the temperatures will be way up here, and reality just as consistently fails to cooperate and puts temperatures way down there. That model is therefore a failure. It is busted. It is broken. It is not right. It should not be trusted. It should not be used as a basis for any decision. It is wrong. If your model and reality don’t match you cannot claim that your model was right all along and the observation not the real observation. Such as action is preposterous! Oh Lord. The claim that climate models systematically overestimate the response to radiative forcing, or are busted in some other way, is entirely well founded. Founded on what? Founded on model failure. Years and years of model failure, too. How is it that we have come to the point where such a basic scientific principle that models which make lousy predictions are wrong yet are still considered right? Not only that, but the authors are, in the modern parlance, doubling down. They tell the Daily Mail that not only are the models to be trusted, “The long-term trend points to severe warming of the climate”. How could they not see that this is silly? I don’t know the answer. I’m too depressed to continue, except to remind us we talked about this twice before. Look, sisters and brothers, if we (as in climate scientists) knew what the temperature was going to be, we would have been able to skillfully forecast it. We were not able to skillfully forecast it, so we did not know what the temperature was going to be. To speak of a “hiatus” or “pause” logically implies we knew the “hiatus” or “pause” was going to be there, that it was expected, that we knew in advance its causes. We did not know. If we did know, we would have predicted it. Which we didn’t. Update Reader Gary (see below) suggested writing a letter to Nature. I submitted one. Here it is. You create a model which predicts the sun will rise in the west. The sun fails to cooperate and rises in the east. Do you admit failure or write a paper to Nature which explains your failure as a success because the sun was exhibiting “natural variability”, a phenomenon of which your model cannot be expected to capture fully? This is false. A GMST model is built to predict GMST. Any departure of the model’s predictions from the GMST observations is due to a fault or faults in the model and nothing else. It might be that GMST is chaotic, or again it might not; either way, it is the duty of the model to capture the essence of GMST, whatever that essence is. If that essence cannot be captured, for whatever reason, the model has failed. Why the model failed is interesting to the model creators, but not necessarily to anybody else. Further, identifying the reasons for the failure belongs solely to the model creators. A person showing the model has failed has no responsibility whatsoever to offer reasons for the failure. A fortiori, if the model has loudly and repeatedly make promises it has not kept, it is irrational to trust the model. Now this used to be a well known scientific principle. Once, it was known, believed, and acted upon that models which produced rotten forecasts were admitted to be wrong, and were fixed or abandoned. Never were the predictands—the things the model forecasted—blamed for error. Never were mistakes waved aside and statements about the model’s intrinsic goodness given out. Why this reversal from common sense to the state we are in now is a question I leave the reader to answer. The bulk of the climate signal must be natural variability. This is so unless somebody has proof that man drives most of the (entire) climate. Any climate model worthy of respect thus must be able to explain and predict natural variability. If model cannot capture this natural variability, the model is in error. Global climate models promised good predictions of actual GMST. In this they have failed. Therefore they are in error. There is no escaping this logical necessity. Update An editor at Nature kindly showed me that I clicked the wrong button (or whatever). The letter has been resubmitted as of 1:30 PM, 6 February. Thanks to Al Perrella and others who pointed out this newest attempt to avoid responsibility. If natural variability is the climate, and natural variability caused the ‘pause’ (which is the climate), this means that the climate caused itself. Therefore, the climate is a necessary being, worthy of worship. I’ll call this “Al Gore’s First Way”. Fascinating. I guess Las Vegas doesn’t work either then, They have a model of what happens when a ball falls into a sector slot on a rotating wheel. And yet, on my first trip there many years ago, I left the wheel with $75 more than I came with. And I’m far from the only one. They have a model of what happens when a pair of cubes with numbers on their sides are tossed into a variegated surface and the numbers facing up when they come to rest are noted. And yet I’ve also left the craps tables many times with more money than I came with. With the buffets, the free drinks at the tables, pretty reasonable hotel rates, etc., considering that their casino floor model is clearly broken, I wonder how in the world they make their money. Journals of record such as Nature need to be called out on this. Write a reply or a letter spelling out the problem and how the logic fails. Make a stink. Just be sure it’s simple (keep Monckton’s hands off it) and defensible. Issue press releases. You have standing as a published author. They already dislike you so what’s to lose? So, if it weren’t for the climate, the climate models would be right? In United Soviet Socialist Republic of America, what glorious government’s scientists say is more important than environment. I have a better idea. The expression natural variation is like the word chance which is, as you have said in the past, an expression of causal ignorance. Make this simple substitution and it all makes perfect sense for now we have. The gap between the calculated and measured warming is not due to systematic errors of the models but occurred because of our ignorance. And in your example the sun failed to cooperate and rise in the west because of our ignorance. Thus climatology joins the venerable field of educational research where the greatest awards are for failure. Sounds almost the same as this article. I guess you have seen the latest CA post? Nic Lewis points out that Marotzke and Forster’s calculations show that Delta T is proportional to Delta T.
I thought that “Natural Variation” was the argument that that evil “denialist” community uses. The predictions of the models based on those gambles matches very, very, very well with the observations. So it’s false to say Las Vegas “doesn’t work.” Indeed, the opposite of your intimation is true: in one case we have models which make poor predictions and which anybody using them as is would lose money on, and in the other we have models which make excellent predictions and which allow casinos to clean up. Let me ask a question of statisticians (which was alluded to in Rob Ryan’s comment–I think). Suppose you make a prediction about mean values (i.e. in a hypothetical sample of many earths) but in one particular earth (the one we live in) the value is different–due to “natural variation”, i.e. values outside the mean, is your prediction bad? What I’m trying to get at, is do these predicted temperature variations include error limits that supposedly account for “natural variation”, and do deviations due to “natural variation” follow a random pattern or do they show–what’s the technical term–heteroscedascity (sp?)? All probabilistic predictions, of which GCMs more or less are, can be rated using proper scores. These take into account the forecast distribution and actual outcomes. On top of proper scores are skill scores, which compares the proper scores of complex models with simpler ones. Persistence is the most common simpler model. It says, “What happens next year is what happened this year”. GCMs can’t even beat that. Propriety is a technical term and so is skill. I’ll do a post about these. Originally, natural variations were indeed part of the calculations of projected climate change. CO2 was the driver and determined if the planet warmed or not. However, as the leveling of temperatures continued and the rise of CO2 continued, there was a problem. Suddenly, the contention that was the original premise of global warming–that CO2 overcame all natural variations–was looking not so good. So, one could re-examine the theory (not happening, of course), one could say natural variation explains the leveling (not accurate and contradicts the CO2 is most powerful argument) or keep saying CO2 is the main driver and in a few years or decades it will become obvious how right the global warming people are (as in “We’re right and you just wait and see how that works out” You just don’t understand climate science). Had the global warming people not been so adamant about CO2 being king of the warming mountain, they wouldn’t be in this position. You’re confusing a spin of the wheel with the overall average score for many spins of the wheel. Do you consistently win at the craps tables? No? Then I’d say the casino’s statistical modelling is doing fine. Do climate models consistently make wrong predictions? Yes, then the statistical modelling is not fine. Models incorporate various theories of climate and have what’s sometimes referred to as ‘weather spread’. If the weather spread/natural variability diverges significantly in the model from the real world observations of natural variability, you have a problem. Of course, you can always claim that the natural variability was underestimated in the models but then that opens up a can of worms. First, that suggests something fundamental about your modelling of climate is wrong. And secondly, the wider and wider you make your weather spread, the less you can say with certainty as to what caused patterns of warming and cooling in the past. But…but… Vegas’ models cannot work. I’ve left the craps tables many times with more money than I started with. Others have too. Is that a “pause” in their profit making enterprise? On top of that, in my younger days when it was still possible, I counted cards at blackjack (an exceptionally dreary way to spend time, by the way), and many is the session during which I lost money so those models must be broken too. In particular, the system I used was developed by Julian Braun and predicted an advantage at various deck configurations and provided optimized play for various hands under various deck configurations. It was a computer model. Yet I frequently lost money. You just can’t trust computer models. And yet… and yet… in the long run I made money and it appears from my naive investigation that Vegas does too. This is the prediction the statistical model that Vegas casinos run on: that Vegas casinos will make a profit at the end of the year. Guess what? The prediction has been right for decades. That means the model is working. Just because you make 50 bucks at one game doesn’t mean their prediction that Vegas casinos will make profit is wrong. As you stated yourself “it appears from my naive investigation that Vegas does too.” If the Vegas casino model was busted, they would no longer exist because they would be bankrupt. So Rob we’ve established (a) you can’t read because where you went wrong was explained to you but you press on anyway, (b) you’ve demonstrated you don’t understand even simple concepts such as averaging and (c) it’s very clear you don’t understand how climate model averaging works either. But anyway… how much did you walk away with at the craps tables? $1 more than you started? $1000 more? $1 million dollars more? Do you believe all probabilities in each case are equal? Casino’s know that they will loose money at black jack if you count cards. That’s part of their ‘modelling’ which they were fine with, because it takes a lot of skill to count cards and very few patrons ever bothered to do it. Then it became a profession for some gamblers, and Casino’s cracked down on the practice when it became more frequent. Not all models are bad. Validated models have some rational basis for confidence. There is no rational basis to accept the findings of an unvalidated model. Such as, for example, a climate model. Mr. Ryan, yours’ is as clear and clean an admission as I’ve seen of being unable to understand probabilities. The casino model isn’t that players won’t win; it’s that players won’t win as much as the should have, considering the amount they staked. Hint: The difference between “did win” and “should have won” is what keeps the doors open 24/365. Look, sisters and brothers, if we (as in climate scientists) knew what the temperature was going to be, we would have been able to skillfully forecast it. I hardly need remind you that forecast skill is a calculated value. It’s safe to say that no AOGCM will ever score a perfect 1. My perennial question is; how close to 1 does an IPCC-approved model need to get to perfection before you deem its output useful? While we’re on it, I specifically looked for a skill calculation in MSLB (2015) when it first made the rounds hoping it would shed some light on my question. Closest I found was Fig. 6, accompanied by the following text: 9 How skillful is the model? Remarkably, though the model is very simple, its output proves to be broadly consistent with observation, while the now-realized projections of the general-circulation models have proven to be relentlessly exaggerated. Did you even do a skill calculation? We will, of course, all share the same future physical reality. The planet itself doesn’t give a gosh darn about our political positions. Steve McIntyre’s take on the article. Similar to Briggs. Either you are being sarcastic and I am missing it or you really don’t understand how casinos work. I do, I used to work in one (I.T. I installed and maintained the gaming systems). The casinos generally don’t care if one person wins*. What they do care about is that 51% of the guests lose. When you won on the craps table, did every other player who played craps at the same time win? Did every other player who played craps that day win? Certainly not. Casinos make their money because the odds are stacked in their favor and, over time, the odds play out as expected. A one time event, you winning at craps, has no effect on the rake that the casino will take in that day. The only effect is on you, because you happened to be the lucky fool (and I mean fool as in a ‘fool and his money are soon parted’, gambling is a fools game unless you own the casino) who walked out a bit richer. The reason your win will not affect the casino is because other players lost. The casinos models are accurate. The odds on craps are well understood as are the odds on the machines and card games. The casinos know that they are going to payout ~97% on slots over the lifetime of the machine. If 100,000 is put into a slot machine, 97,000 or so will come back out. That could come all at once, and one lucky fool could walk away with 3,000. Or it could be spread across numerous players. However, the amount of money that the casino takes is the same, ~3,000. And guess what? The casino, except for marketing purposes, doesn’t care how the payout happens. The casinos do like to spread the wealth a bit, instead of having one giant winner, they would like to have more winners who win less. So they adjust the payouts, especially on slot machines, so that they get the payout curve that they want. * Very rarely, a high limit gambler will hit a streak at cards, craps or roulette. The casinos do care about this as it can take a big chunk of the days profits. However, it happens very rarely and is expected. In your response to Sheri, your invocation of the precautionary principle is admirable for its subtlety. Alan, thanks. I was thinking she might appreciate a two-liner from me for once. Title that “Silly Excuse for Climate Model Failure #72” and send it in to Nature. You will be a published author. Really, they’ll run it. They can’t help themselves. How many casinos have lost money for 18 years straight? A customer enters a climate modelling research institute. O: We’re closin’ for conference in Peru. C: Never mind that, my lad. I wish to complain about these climate models what I purchased not half a century ago from this very boutique. O: Oh yes, the, uh, the CMIP5 ensemble…What’s,uh…What’s wrong with ’em? C: I’ll tell you what’s wrong with it, my lad. ‘E’s not making accurate predictions, that’s what’s wrong with ’em! O: No, no, ‘e’s uh,…it’s just random variability. C: Look, matey, I know dead models when I see ’em, and I’m looking at bunch of them right now. O: No no they’re not useless, just weather spread! Remarkable technology, the CMIP5 ensemble, idn’it, ay? Beautiful mathematics! C: The technology don’t enter into it. Them can’t predict nothing useful! *Special thanks to Brandon Gates. “A climate model consistently says the temperatures will be way up here, and reality just as consistently fails to cooperate and puts temperatures way down there. That model is therefore a failure. It is busted. It is broken. It is not right. It should not be trusted. It should not be used as a basis for any decision. It is wrong. 14.3657 – Observation will be non zero. it will be wrong. always and forever. However, you can still trust it. you can make decisions based on a wrong model. You can make good decisions based on bad models. We do it all the time. You can make successful good decisions based on horrible models. With climate models I can note that they are high. I can not that they predict 2C of warming and that this is probably high. That’s actually useful. I could for example base a decision on that biased result. I want to know what to plan for. I have a prediction that is 2C from a model that is known to be biased high. I now have a boundary. All models are wrong. All wrong models are useful. The trick is finding the right use. Well, I see that sarcasm is lost on the crowd here. But of course I press on. Yes, it’s clear that Vegas’ model does in fact work, though “natural variation” means that the predictions that it makes (37:1 against my choice of 4 for example) that when I place my bet I will lose my money will be turn out to be incorrect on occasion. Conversely, in card counting, where I’d have very long streaks of losing money despite Braun’s model that predicted something like a 1.75% advantage depending on how much I could spread my bets in those halcyon days of counting. Models (yes, computer models run in those days on IBM 370s) predicted that I would win something like 1 “big bet” (the size bet I’d make when the deck configuration was predicted to be in my favor based on the cards used up to the time of making a bet) per hour if I could play 50 or 60 hands per hour (possible when playing heads up against a dealer). But I had streaks of 50 hours of losing half or more of a big bet per hour. In the end, my advantage would win in a given several thousand hands, but a loss over 500, 1000, 2000 hands was quite possible. So I guess that was a pause in my winnings. The casinos win because they conduct (a wild guess here) millions of experiments per day (and also because people play roulette or bet the hard ways or split 10s or stand on 15 when not counting, thereby increasing the house’s advantage). My experiments of mere hundreds per day resulted in lengthy (and discouraging) hiatuses or pauses. But the counts of cards were based on sound models and, played with close to perfection, would win over time. Modeling the results of random (whoops, not random, unknown) configurations of 52, 104, 208 playing cards dealt, turned over, and scored in accordance with a simple and well-known set of rules is a relative piece of cake, and yet I suffered my pauses. Modeling geophysics and fluid and thermodynamics in the ocean/atmosphere/land/biota system is rather more complex. Nonetheless, the contention that the models have failed is demonstrably incorrect. Further, it would be shocking if, given the radiative characteristics of carbon dioxide which cannot fail to ensure that more energy is retained in the system than would otherwise be the case, the result over extended periods would fail to be increased temperatures somewhere in the system. And only the most far removed crackpots (I’m looking at you Joseph Postma) dismiss the radiative characteristics of CO2 and the consequent increase in total energy in the system. Where do y’all figure it has/will/would express itself? Yes, parameters are not well known, the grid size is much larger than would be desired, the time steps are larger than desirable, numerical accuracy of the computation and measurement precision of the system are not what would be preferred (I don’t say “we’d prefer” for example because I doubt readers here would prefer it or desire it) but if you add energy to a system, it WILL find a new equilibrium. The models reflect that imperfectly. I ‘ate it when my English composition skills ‘ave run down the curtain and joined the bleedin’ choir invisibile. But I gather the point of your creative, and appreciated, allusion to expired Norwegian Blues is your gentle way of saying the AOGCMs are so bad that asking Dr. Briggs for hard numbers in lieu of qualitative comparatives is tantamount to asking for a research grant from the Ministry of Silly Walks. Which in my view is an ex-argument that in a rational world would be pushing up daisies. But alas. It’s a Zombie Parrot, one wot stole the battery-bunny’s drum and uses a perpetual motion machine to beat the skins for all they’re worth. Far too distracted by its own din to notice that yes, one of its feet happens to be nailed to a post and that it is, in fact, marching in endless circles looking ridiculous. You mean like Mann’s Nature Trick? Like we use to say: “if it don’t fit it, hit it”. Hoi Pollo, one wonders why, with all the data manipulation going on, the much-maligned models don’t more perfectly fit the “observations”. Now, the Copernican/Newtonian model is wrong too, because while it predicts more precisely and especially consistently over time — even here, over time there will also be discrepancies, and that’s where Einstein comes in. But again, here is the problem. To assert that ‘all models are wrong’ tries to confuse things by pretending that because no model is perfect, no model is therefore useless. An assertion of like that is not an argument, it’s a failure of logical thought. What Mosher should have written is that a model can be wrong in the short run but right in the long run. Yes, of course. That’s stating something we all know. Anyone on this forum probably does or should have a basic understanding of probabilities. But there has to be bounds to this. If the physics of the model says that a failure to increase temperatures by a specified trend over a specified time period is a thousand to 1, that model is not ‘wrong’ in the sense of being imprecise. That model is wrong in the sense that Ptolemy’s model is wrong. How did you decide that the model is biased high? How do you have any confidence that you are right about it being high, and that it will continue to be similarly high in the future? When we’re discussing model failures we’re not talking about the failure to be precise. We’re talking about the failure of the model to predict. Pure, unadulterated horsecrap. Here’s Briggs’ statement again: Look, sisters and brothers, if we (as in climate scientists) knew what the temperature was going to be, we would have been able to skillfully forecast it. We were not able to skillfully forecast it, so we did not know what the temperature was going to be. Forecast skill is quantifiable. Dr. Briggs is a statistician. He knows this. Yet he, and now you, refuse to put a quantity on what specific skill score would constitute success. Since all models will always be wrong, their prediction skill will always be < 1 no matter what reference model is used for the calculation. Honest, rational people know this. And they admit it. They're willing to say: why yes, this model is wrong and always will be, but it beats a naive model of no-change (or a linear regression, or whatever) over periods of 50-100 years, so for purposes of planning 50-100 years into the future I have decided that it's useful. Implicitly demanding perfection knowing full well that you'll never get it is transparently dishonest game-playing here. It looks a lot like dodge-ball to me. I find this an odd statement. For example, I add energy to my body everyday (eating) but my temperature does not change nor do I gain weight. The possibility of regulatory systems is routinely ignored in this discussion. Willis Eschenbach, may he be blessed, has discussed this point in great detail. It is not through lack of trying as, for example, the ongoing struggle to make the past colder but this type of manipulation is getting riskier. Too many watching eyes. It is not through lack of trying as, for example, the ongoing struggle to make the past colder but this type of manipulation is getting riskier. Sorry, but the big three global temperature products come along with detailed descriptions of the adjustments made, why those adjustments needed to be done, source code for the algorithms that do it, and the before and after results right down to the station level. That kind of transparency is the exact opposite of “not for lack of trying”. While watching eyes are appreciated, when such a large number of them invoke implausibly k00ky conspiracy theories like this, it tends to erode credibility. I agree that credibility has been eroded, but possibly we are referring to different people. It also seems to me to be the height of chutzpah to accuse your critics of conspiratorial thinking when you have been caught red handed. McIntyre at Climate Audit has done yeoman’s service in exposing many a scoundrel but I kind of like Josh’s latest take on this subject. We could start by constructing a model (or scores of models) and testing, tuning a bunch of parameters, re-testing and getting a pretty good fit with a 30 year hindcast and then we wait and see how that model (gaggle of models) does in actually forecasting the next 30 years. If it does about the same as it did in the hindcast, we can say that it’s still wrong but it’s got potential as a forecasting tool and we will use it hoping it does not go off the rails, right away. But I am not as smart as Briggs and Nitschke. What do you do when you have a hundred models that are all wrong? How do you pick the one that will make the best predictions? If you line up a hundred sad looking recruits on the firing line in basic training and have them take five shots, is the guy who got closet to the bullseye a skilled marksman, or was he just lucky? Yes, I saw that cartoon when it posted. Now tell me why BEST’s homogenization algorithm having adjusted that one — ONE!! — weather station’s data necessarily constitutes bomb-proof evidence that the entirety of climate science is a crock. Why would powerful, effective conspirators be STUPID enough to even allow you the tools to access the evidence of their malfeasance in the first place? Having answered that stunningly obvious rhetorical question, revisit my initial question to Hoi Pollo and model/”observations” disagreement. I agree that credibility has been eroded, but possibly we are referring to different people. Right now I am referring specifically to you, and your apparent complete lack of critical thinking skills on this topic. Scotian, you are clearly an intelligent person. I don’t know if you’re being purposely obtuse with your analogy. Yes, you take in energy. If you take in an identical amount every day and reduce the amount you use (in other words, less leaves you), your body will find a new equilibrium. Various things will regulate this, of course. You might, for example, sleep with less blankets, thereby causing your regulatory system to use more energy to maintain homeostasis. But if all else remains equal and the same amount comes in and less goes out, your body will find a new equilibrium and you will be able to measure it on a scale. Many things take place on Earth as energy arrives from the sun, but if less energy can leave, a new equilibrium must be found. A regulatory system that prevented this result would have to (as in “have to” to use Dr. Briggs’ trademark phrasing) find another way to shed energy to space. Do a simple analysis. System boundary is top of atmosphere. Energy in is insolation. Energy out is radiative energy since convection and conduction are not possible (unless you contend that mass crosses the boundary). The first law of thermodynamics (conservation of energy) requires that delta Q=Qin – (Qout + Work done). Since the system does no work, delta Q =Qin-Qout. If Qin doesn’t change and Qout decreases, delta Q must increase. This doesn’t necessarily mean a temperature increase of course, perhaps latent heat increases (ice melts, water evaporates) or kinetic energy increases (wind speeds, ocean waves, etc. increase). But it’s not possible for delta Q to not be positive unless you posit that either: a) CO2 does not reduce outgoing long wave radiation; or b) some other mechanism allows mass/energy to cross the system boundary. Which is your choice? We could start by constructing a model (or scores of models) and testing, tuning a bunch of parameters, re-testing and getting a pretty good fit with a 30 year hindcast and then we wait and see how that model (gaggle of models) does in actually forecasting the next 30 years. We don’t have to wait to do that exercise. We’ve got 150+ years of instrumental data to validate against, plenty of room for a 30 year hindcast with the balance being treated as out of sample. What do you do when you have a hundred models that are all wrong? There’s no if about it. n number of models will always be wrong, else they wouldn’t be models. How do you pick the one that will make the best predictions? If I’m held to one and only one, I’d instinctively choose the one with the best correlation to observation. We’re not held to one, and as you likely know, the IPCC publishes the results of hundreds of model runs in an ensemble mean for the four different projection scenarios they defined for AR5. If you line up a hundred sad looking recruits on the firing line in basic training and have them take five shots, is the guy who got closet to the bullseye a skilled marksman, or was he just lucky? Impossible to know, and wouldn’t care unless I was looking to recruit a scout sniper. For infantry, I’d look to see what percentage of those 500 shots hit paper and compare that to any intelligence I had on what the enemy’s recruits were shooting. If I found out the opposition’s newly-minted troops were shooting 100% on target at 50 yards blindfolded, I’d know I was dealing with Texas Sharpshooters, and figure that my guys’ 50% on target might just could get the job done if I had to graduate them tomorrow. It would be a judgment call though, as all such things always are. When talking forecast skill, one needs to be specific about the intended use of the model. When Briggs says a model isn’t skillful and leaves it at that, he’s not conveying any useful information. He knows this. One can’t have a PhD in statistics and not know it. 1. To accurately predict the trajectory of a chaotic system beyond the predictability limit of the chaotic system. Believing that a model should be able to do this indicates a non-understanding on your side of the nature of physical systems that show chaotic behavior. 2. To never show any discrepancy between observations and model projections, even if the input into the model, with which the model is driven when a model simulation is done, diverges from the observed drivers of real world climate. Even a perfect model will give results that differ from observations in such a case (if you prescribe twice the forcing increase of the real world for the model simulation then the predicted temperature trend with the model will be about twice as large as the observed one). In this case you will conclude that the model was a “failure”, in contradiction to the premise that it was a perfect model. The conclusion would be a failure of logic, not evidence for the failure of the model. You make a claim about alleged “promises” that had been made and not fulfilled regarding the skill of climate models. Promises by whom, made where and when? I would appreciate if you backed up this claim by presenting some scientific references with the alleged promises. Whether there are really discrepancies between model projections and observations or whether apparent discrepancies can be reconciled when all aspects of a problem are taken into consideration has to be carefully studied. That is what scientists do. They are also careful about the conclusions than can be drawn from an analysis. They don’t just throw everything away right away, when something doesn’t match perfectly, apparently in contrast, what you would like them to do, because it’s you who jumps to conclusions. You accuse others to violate the “scientific principle”. It looks to me more like that you don’t understand much about the scientific process. In December 2014, Willis posted GMT series generated by 42 CMIP5 models, along with HADCRUT4 series, all obtained from KNMI. We were able to analyze the temperature estimates of CMIP5 models and compare them with HADCRUT4 (1850 to 2014), as well as UAH (1979 to 2014). The models estimate monthly global mean temperatures (GMT) backwards from 2005 to 1861 and forwards from 2006 to 2101. 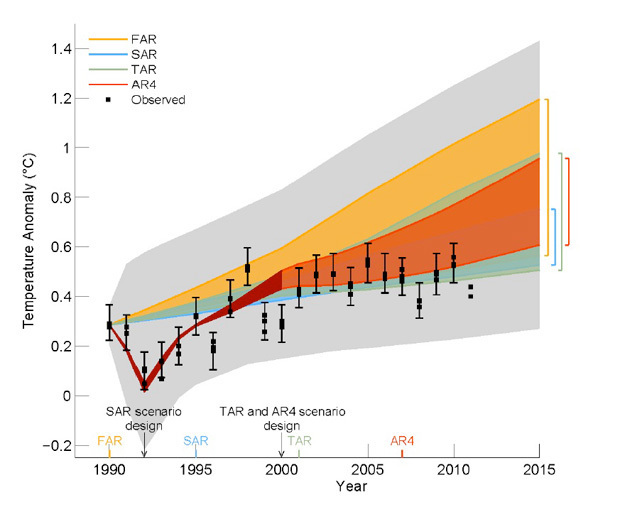 In contrast with Series 31, the other 41 models typically match the historical warming rate of 0.05C by accelerating warming from 1976 onward and projecting it into the future. 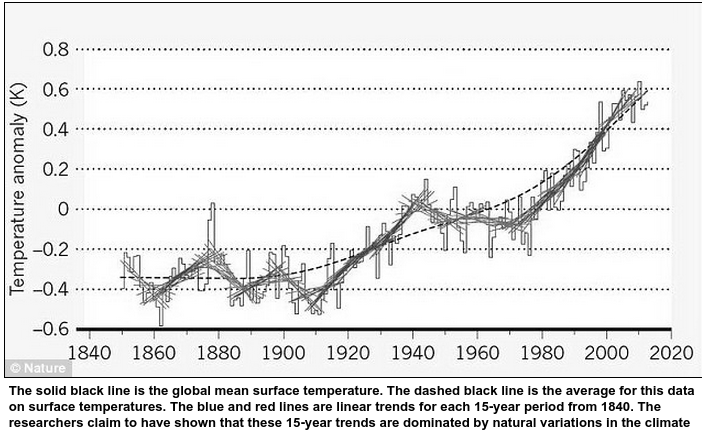 Over the entire time series, the average model has a warming trend of 1.26C per century. This compares to UAH global trend of 1.38C, measured by satellites since 1979. I am assuming that Briggs is talking about the models being inadequate for making/guiding policy decisions. What do you think he is talking about? Is the guy who got closet to the bullseye a skilled marksman, or was he just lucky? I will help you. You don’t know. Sorry, Brandon. I see that you said impossible to know. I got distracted by the rest of it. I am assuming that Briggs is talking about the models being inadequate for making/guiding policy decisions. How close to a perfect skill score of 1 does an IPCC-approved model need to get before you deem its output useful? I will help you. That was the first sentence in my response: Impossible to know, and wouldn’t care unless I was looking to recruit a scout sniper. If you are looking for absolute certainty, I suggest you study pure mathematics or join a convent. There’s a rich tradition of doing both, and much good work has come from it. You’re clearly out of your depth when it comes to how those of us living in the real world approach risk-based policy decisions in the face of large uncertainties which simply cannot be magically waved away by wishful thinking and bad-faith debate. If it makes you happy, I’ll be sure not to sign up as a drill instructor any time soon. Don, our messages crossed which is unfortunate. Though I’m not sure it would reduce the ire I’m feeling from the first block of my response. Brandon, I almost always enjoy reading your comments, since you attempt to be rational (and most of the time succeed) and to avoid ad hominem arguments. Nevertheless, the warmist arguments are so immersed in failures of scientific integrity, so entwined in the loving arms of politicians, that given the obscurity of the scientific arguments and the ability to mess with data, I can’t believe anything that comes from that camp. The perversion of the review process, the ad hominem and character assassination of those who promote the warmist cause contaminates any good science that might come out of the enterprise. Finally, since I regard the best evidence that humans contribute only minimally to climate as historical: the Medieval Warm Period and the Little Ice Age that followed (from which we were recovering). That evidence trumps programs that attempt to predict climate change. Have you read any of the emails and computer comments from Climategate that show fudging of data and attempts to pervert the natural process of scientific inquiry? If so, I’d be interest in your comments on these. Don’t get mad, Brandon. This is just a blog discussion. I said I was sorry. Notice I didn’t say, I misspoke, or that I conflated one huge damaged downed helicopter with the undamaged one that I was riding in. Maybe Briggs will tell us about it, when he is around. I wouldn’t let it upset you too much. I don’t think most of us care what the climate scientists do with their models, behind closed doors. It’s when they use them to support predictions of catastrophic scenarios that we begin to ask about the reliability of the things. And why do they need so damned many of em? In answer to your various questions. If you follow the links within my link you see that there is more than one abused temperature record. As to why people are stupid, there are many possible reasons but arrogance tops the list. When you have gotten away with so much over the years one gets sloppy. Despite that, many researchers have gone to extrodinary lengths to hide their methods as has been amply documented by McIntyre. I’ll ignore your parting insult and attribute it to the stress of debate. An initial compliment is usually a set up for a later insult. There it is. Not obtuse at all. You made a statement that was clearly wrong and I was able to demolish it with a very simple analogy. This is why you are now going to great lengths to try to close up all the loopholes by adding a serious of limiting statements. I’m not going to try to follow your math because you have not stated what Q is. It usually means heat but that can’t be the case here because then your equations wouldn’t make any sense. I just worked out a very naive model on the back of a napkin. It says that temperature will not increase or decrease, from whatever baseline I chose, by more than 1C in a hunnert years. Back casting looks good. When do I get my check? Of course, certainty bounds are in a way based on ‘scientific traditions’. Why is 5% the cut off? That’s fine. But the wider you make your bounds, the less useful your model becomes. Eventually your model becomes useless because it can predict anything. We’re starting to live in a very bizarre world indeed, when people start to claim that comparing predictions to observations is an “unfair test”. Why shouldn’t such an argument be greeted with laughter and mockery? Jan, let’s grant everything you say is true for the sake of the argument. Then you’ve demonstrated that climate models can never tell us anything useful. Ever. If so, then let’s ignore them, and move onto more fruitful fields of scientific inquiry. That’s not unusual. There are lots of things we have scientific understanding of, yet, cannot use that knowledge to make predictions about the future. How animal species might evolve, for example. Fine. But don’t set-up a gigantic government bureaucracy whose purpose is to tell us how animals will evolve in the future, and what we must do about it to protect those future species today, for example. If climate models shouldn’t be objectively tested, because even perfect ones are wrong, let’s stop funding them. OK Scotian. I do think you’re an intelligent individual and I thought that I was giving you the benefit of the doubt. Demolished it? My rear end. You claimed that the fact that you eat every day and don’t gain weight somehow shows that a thermodynamic system can absorb energy through the system boundary at a constant rate, discharge less (assuming that you would agree with the established radiative physics of CO2) and maintain a constant equilibrium. Your body won’t do it and the Earth won’t do it. It’s surprising to me that you’d use such an obviously flawed analogy, but I suppose that it’s such a transparently simple concept that you’re kind of stuck with relying on your flawed concept and hoping that no one notices. I’ll change symbols dEtotal=dEin-(dEout+W). dEtotal is a change in total energy (it’s not a differential) during a small period, dEin is the energy coming in through the boundary during that period, dEout is the energy leaving through the boundary during the period, W is the work done by the system on the surroundings, here equal to zero. Thus, if dEin/dt remains constant and dEout decreases, dEtotal must increase. You can argue: a) the system does work on its surroundings; b) dEout does not decrease (CO2 does not decrease outgoing longwave radiation OR mass/energy crosses the boundary outbound some other way); c) the first law of thermodynamics is incorrect. As I said, if the simple equation does prevail, dEin can reside in many domains: kinetic (winds, waves); potential (maybe electrical charges are somehow separated); thermal. For whatever portion is thermal, temperature will increase such that outgoing longwave radiation reestablishes equilibrium. With which aspect of this do you disagree and why? Please point to where Scotian claimed what you claim he claimed. Shouldn’t be too hard, if he actually made the claim you seem to have made up all by your self. The issue I am interested here is model skill — and Briggs’ statements about their forecast skill in the present era. I don’t see that the MWP and LIA trump any discussion of this; we assess model skill over the periods of time covered by the models themselves. If you insist we pursue the point, consider that you’ve invoked it from a position of weakness — namely that you believe the science to be tainted by Climategate — so clearly Mike’s Nature Trick is out. Which leaves me wondering what evidence you’ve got of the MWP and LIA and why you would even trust those data to begin with. Every model will have its own range of forecasting skill scores. Well then, that’s even more reason why it is not acceptable to say that models are not skillful without providing the range of those scores. Your comment is better directed at Briggs. Model skill is Briggs’ argument not mine. His argument, his burden to quantify it as one would expect a trained professional statistician to do. Let him move the goalposts if he wishes. Eventually your model becomes useless because it can predict anything. And we’ve come full circle to the implication that nothing less than perfection will ever be acceptable. Nobody living in the real world does risk assessment this way. If all forecasts were perfect, there’d be no need to assess risk. Model skill is only part of the story and may not even be all that important. A model can predict something that happens for reasons not understood by the model. A failing models spells the death of the model. A model that gets some gross feature of a climate system nearly right isn’t much proof either, that the model is good. In science the strongest evidence for a model arises when it makes hitherto unexpected novel predictions. These models do make lots of such predictions, such as mid tropospheric warming should be greater than surface warming, stratospheric cooling, regional patterns of precipitation, polar amplification (both poles) and so on. Now if these more specific predictions are ever discussed because models fail even the gross feature tests, such as temperature prediction. Your last post directed at me ignored all the points I made, then addressed some imaginary straw man version of myself. So that you could end agreeing with yourself. Our messages crossed. I accept your apology. I would be frustrated an angry regardless because this is more than just a blog discussion for me. I apologize for the extent that I directed it at you inappropriately. Thanks, but I hold to my own counsel about what angers me and what doesn’t. It’s when they use them to support predictions of catastrophic scenarios that we begin to ask about the reliability of the things. Absolutely. Any proper skeptic would. And why do they need so damned many of em? The issue I am most interested in discussing is the skill of the ensemble, not why the ensemble. Briggs says “the models” have failed because they are not skillful, but has not shown any skill calculations, nor has he described what skill would satisfy his requirements of success. When professional statisticians use statistical arguments to advance an argument, one begins to ask about the reliability of their assessment when it is entirely bereft of any quantified analysis. I believe I’ve already commented on this, but I’ll restate and expand. A climate model which shows forecast skill greater than zero over a period of 50-100 years is something I deem useful. The closer to one the better, of course. In my view, the utility of such a model is to do impact and risk-assessments about the ability of the environment to support present or better standards of living for future generations — primarily for my nephews and their future children, and to a lesser but significant extent all of humanity. Model skill is only part of the story and may not even be all that important. Tell it to Briggs, model skill is HIS argument: Look, sisters and brothers, if we (as in climate scientists) knew what the temperature was going to be, we would have been able to skillfully forecast it. We were not able to skillfully forecast it, so we did not know what the temperature was going to be. A model can predict something that happens for reasons not understood by the model. Indeed. I think that’s another great question for you to pose to Briggs. A failing models spells the death of the model. I’m still waiting for someone other than me here to define model success. Perhaps we should refer your first (albeit indirect) response to me, which was a delightful parody, but a parody nonetheless. Now you’re challenging me about model skill when you should be challenging Briggs. You further say that a model can make the right prediction for the wrong reasons. All of which does cause me to wonder if you would ever consider any model useful. Do feel free to disabuse me of this notion by describing when models are useful, and what your criteria are for making that determination. If you follow the links within my link you see that there is more than one abused temperature record. How honest of Josh’s cartoon to show only one. But I knew that already because I don’t read cartoons to learn about science, I read primary literature. So if I’m interested in why station data have been “abused” I go read the paper which describes the process. I note that the before and after data are freely available for download by anyone. It would be lovely to see Josh draw a cartoon about conspirators who are so inept they can’t help but publish to the world exactly how they’re hoodwinking all of us. But I won’t hold my breath. I’ll ignore your parting insult and attribute it to the stress of debate. My anger is due to the nature of the situation. I directed more of that at you in a personal manner which I regret and for which I apologize. A successful model will make verifiable novel predictions. A successful model must do so within a span of at least 15 years. A model that can only be tested each 50-100 years is laughably idiotic as such models will take hundreds of decades to test and refine. It’s taken multiple decades to refine weather models to where they are now, and that is with 24 hour feedback on the results. A successful model will make verifiable novel predictions. You’re conflating verifiability with prediction skill. “Novel” predictions are what you want. They’re not a requirement for verifiability or skill assessments. A successful model must do so within a span of at least 15 years. Now you’re just pulling numbers out of a hat. A model that can only be tested each 50-100 years is laughably idiotic as such models will take hundreds of decades to test and refine. Now you’ve gone and confused how frequently a model can be validated with its intended forecast period. We’ve got 150+ years of instrumental climate data to validate over. We can do that sort of testing as frequently as people and CPU resources allow. It’s taken multiple decades to refine weather models to where they are now, and that is with 24 hour feedback on the results. Most relevant climate data are updated at least monthly. See also: climate is not weather. I still await your comments on the data/programming fudging and perversion of the review process shown in the Climategate email and computer programming excerpts. and, Brandon, should we believe that models that can’t retrodict (show what happened in the past) will be successful in prediction? Monfort answered most of my points for me and so there is no need to repeat them, but I’ll add a couple of points. What I disagree with is two fold. Firstly there is no regulatory mechanism in your simple attempt to use the first law of thermodynamics, which is still written incorrectly by the way. Secondly you are trying to force the issue by controlling both input and output but in doing so you are no longer discussing a realistic model of the Earth. You can, as a thought experiment, add energy to the input but the output must take care of itself. This is were regulatory mechanisms come into play, with cloud cover being one of the major ones. Amusingly enough this is a similar error to the one made by people who think that simple overeating causes obesity. They assume that they can control both input and output, when in reality they can control neither. They also use a simplistic thermodynamic model as well, as if the issue were as simple as boiling water. My analogy is more subtle than you have given credit. A third point (shades of Monty Python), I think that your emotions have prevented you from carefully reading what I have written. If you really think that I am intelligent than you must also entertain the possibility that you are wrong. Does this not follow, unless you are being disingenuous? I suspect we are arguing in circles, but thanks for the apology. At times I think that I am too old for this but I struggle on, partly through your inspiration. Scotian, thanks (I guess…inspiration can be to emulate or to refute). Who are the people about whom you are talking? What does this have to do with what I said? I didn’t say anything like that. I only have demonstrated that William Briggs’ bar for climate models, which they would have to reach to not be judged as “failures” leads to logical contradictions and, hence, it is his reasoning that is flawed and unscientific. Again, I didn’t say anything like that climate models shouldn’t be tested. On the contrary, they must be evaluated versus observations. This is being done all the time. I also didn’t present such a reasoning. The perfect model is not wrong by definition. Otherwise it wouldn’t be a perfect model. However, if the criteria that must be fulfilled by a model to not get the verdict “failure”, can’t even be objectively reached by such a perfect model then we have a logical contradiction to the premise that the model was perfect. The conclusion from this is that the applied criteria that lead to the judgement “failure” are the ones that are flawed and useless. Not the model. The “perfect model” is a thought experiment. There aren’t any perfect models in science anywhere. The only perfect model in the Nature sciences would be an identical copy of Nature. Every model is an idealization and simplification of reality, which has the function to help with understanding essential regularities of reality. Knowledge about these regularities is the basis for scientific predictions. All models in any field of science are wrong to a degree. If you demand that only scientific predictions are made when they are based on the application of perfect, flawless models you consequently will have to reject all scientific predictions in any field of science, not just in climate science. You also will have to reject all scientific theories, because no scientific theory explains everything perfectly, and absolute truth can’t be reached in science. You basically are someone who is rejecting all science then. Surely, I have a comment: The assertions by Booker are utter rubbish. I’d also be interested in your opinion on the data fudging and perversion of the review process shown in the Climategate excerpts (other than just an opinion). In contrast to what? In contrast to Booker’s opinion, assertions, and smear of scientists? They are mere opinion and assertions about alleged science fraud by scientists, which are not based on evidence. There isn’t any need to say more about it. Since no rational argument has been presented by you, only opinion, assertions and smear of scientists, there isn’t any need to counter with an argument that reaches a higher bar. It’s the typical mode of fake skeptics to smear scientists and attack the results from scientific research with non-scientific “arguments”, when they don’t have any substantial scientific arguments against the presented science. I don’t want to get into your business again, but since we are continuing the discussion of Briggs expressed lack of confidence in the models, I think you are being a little harsh in questioning his right to express his opinion without supplying the analysis that you want to see. Maybe he will get around to it. Or maybe he has discussed it before, or maybe he feels that everybody ought to know the models are out of wack. Some might think you are badgering Mr. Briggs. Can you name a climate model which shows forecast skill greater than zero over a period of 50-100 years? At about 9:30 the scientist says that HadCM3 is a very poor representation of the actual climate. Have you ever heard anything that from a climate scientist, Brandon? There’s a lot of interesting stuff in their. It’s 40 minutes well spent. I’d expected more of you than a refusal to accept the existence of the MWP and the Little Ice Age. It’s also possible that Erik the Red was really good at marketing, that anecdote is not the greatest temperature proxy. The 1990 IPCC graph is well-known to me. There is no question in literature that there was an MWP or a LIA, it’s about confidence in the estimates and ongoing evidence gathering. Outside the literature the debate as I see it is the question of what does it mean that the MWP was nearly as warm (or warmer if you take the error bars into consideration) than today, and what “recovery” from the LIA means. The only way to unravel that is to talk about WHY we think those variations exist in the paleo record because “natural varibility” doesn’t cut it. I notice Harry Read Me is in one of your links, “Oh wait, I can just make it up” had me in stitches. I’ve been tempted to write worse things in my comments, but usually don’t since every so often an intrepid client actually reads my code and what I have to say about their crappy data governance practices aren’t usually very nice. As for the rest, I lost interest in it long ago though I was plenty interested when the emails were first stolen and released. Now I think it’s a tedious and boring topic and not one I’m prepared to debate even if I wanted to. My one-liner response is: if there’s such a widespread conspiracy, why don’t the models agree with the “obervations” better? Which is why I asked you about what data you trust for MWP and LIA. Why do you trust the 1990 graph? I literally, honestly don’t understand how people selectively pick which bits of a given science they accept and which they don’t in this context. Final thought: I’m tired of Climategate being the trump card. I’m taking Briggs to task for being sloppy about discussing model skill. I have one simple question to him, and everyone here: what level of skill do you require for a model to be useful. Nobody’s answered it, the bulk of most of the responses have been of the “Look SQUIRREL!” variety. Invoking Climategate is that game’s Nuclear Option in my view … the best way of dodging direct questions there is. I don’t want to get into your business again, but since we are continuing the discussion of Briggs expressed lack of confidence in the models, I think you are being a little harsh in questioning his right to express his opinion without supplying the analysis that you want to see. He’s free to ask for clarifications, but I’d expect a PhD statistician to understand the point I am making AND be able to better tell me what I want to ask than I could myself. Maybe he will get around to it. If past experience is any guide I highly doubt it. Or maybe he has discussed it before, or maybe he feels that everybody ought to know the models are out of wack. Sometimes my questions are referred to the Classic Posts page without further elaboration, only once I think, by Briggs himself. Usually it’s one of the long-time regulars who fills that gap. Some might think you are badgering Mr. Briggs. Why should that be a problem. And why is it any of your concern? I’ve seen him tell other posters to knock something off, and ban them if they don’t. I take my cues from him and him alone. I’m deliberately not going to answer the question because it’s an open question I have for Briggs and I see it as my disadvantage to allow you to turn it back on me when he has chosen to remain silent on it. Nice try though. That question suffers the same problem that Briggs’ comments about lack of forward-looking skill. All models are always wrong, but some are useful. To determine whether they’re useful, you have to define what their use is, first, and then see if the hindcast meets your minimum criteria for that purpose. Which criteria you have also not specified. You guys are killing me here. I say that with the least amount of malice I can muster. 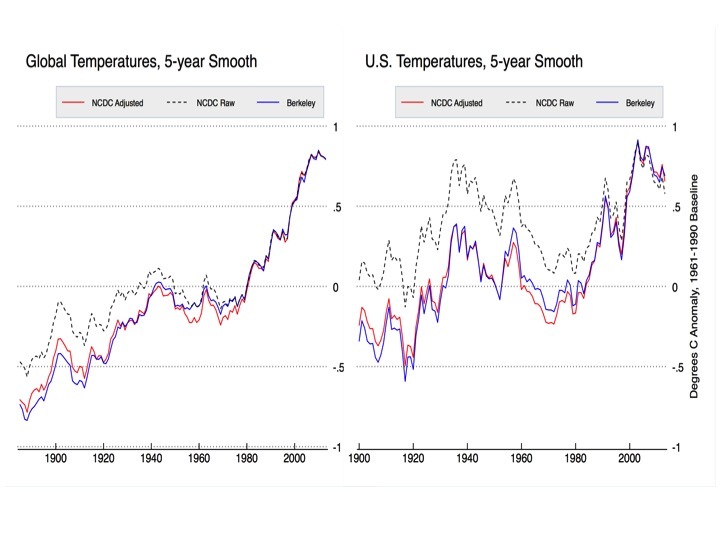 Your statement is obviously based on a comparison between the variability over time of the averaged temperature anomaly from 108 model simulations versus the observed variability of the temperature anomaly since 1993. When you take the monthly temperatures from 108 simulations and you average these then this is equivalent (assuming ergodicity) to an average of the temperature over 108 month equal to 9 years, i.e., it is low-pass filtered. Thus, you compare the variability of a low-pass filtered temperature anomaly that is derived from the 108 model realizations with the unfiltered only one realization that is provided by Nature. Do you see the flaw in such a comparison? It is like comparing the average of the values from 108 throws with a die with another throw and then concluding that the other throw was done with a different die, if it gives you something else than the average value. The models are programmed to calculate the response of the climate to the changes in the combined forcing by all essential climate drivers (which are an input to the models) by numerical integration. When the change in the combined forcing from the climate drivers over time is smaller the response in the temperature (and other variables) will be smaller. If the change in the combined forcing is larger the response will be larger, accordingly. This explains why the calculated net temperature change before the 1970ies is smaller than the change since the 1970ies, and why the temperature change projected with the models over the whole of the 21th century is larger than the observed (and well reproduced with the models) temperature change over the 20th century. Brandon, Climategate will be the trump card until the AGW enterprise has shown it’s cleaned house. Booker’s article (see my comment to Perlwitz below) and other articles have shown that this hasn’t happened. The perversion of the scientific review process continues, as the clamor to fire the skeptic Soon from his position evinces (see Briggs’ recent post). Sorry, I couldn’t find the reference to earth core measurements that support the MWP. Just when I think that I’m out they drag me back in. I remember hearing this statement in high school. It was funny then and it is funny now. As if a major settlement can be sustained over hundreds of years by marketing. I guess that marketing caused the Norsemen to abandon the Greenland settlements as well, because this theory rules out a change in climate. I hope you were joking but one never knows. Another talking point. Why does the method of procurement have anything to do with the seriousness of the revelations? Sounds like an attempt at distraction. This is a debate not an inquisition. The purpose here is to present a position and defend it with logic, not to browbeat our opponents. If the question is of interest to you then give us your position and argument and see if it engenders any interest. Demanding answers to highly specific questions is a debating technique that we all misuse at times but it really should be avoided. There is probably a Latin name for this. Maybe Briggs knows. Perlwitz, you continue to confuse opinion with rational argument. You’ve enlarged on your comment “rubbish” by statements such as “smears against scientists” but you haven’t supported those opinions with facts or reason. From your previous comment I can only wonder whether your knowledge of science is gleaned from the media or from working in the field. When you said models are being compared with observations, if those observations are fudged how worthwhile are the comparisons? Until you show more evidence of rational discourse, there’s no point in further discussion. I will ignore your further comments. I almost forgot. Iceland, another example of the power of marketing. This is a good question, particularly since this graph in the FAR from 1990 is just a “schematic diagram of global temperature variations” (FAR, Figure 7.1, page 202, http://www.ipcc.ch/ipccreports/far/wg_I/ipcc_far_wg_I_chapter_07.pdf ). It’s not an actual statistical reconstruction of the global temperature variability using proxy data, like they were done starting with Mann et al. (1998) and followed with an increasing number of other publications since then. This kind of reconstructions hadn’t been done yet back in 1990. So, why would anyone present the graph from the FAR in 1990 as something that represented the historic temperature record better than the actual reconstructions based on proxy data, if one is interested in advancing our knowledge, based on more data? Nevertheless, the schematic diagram if presented by fake skeptics as if it was based on an actual temperature reconstruction. Some “truth” that now was suppressed by some evil conspiracy. Just another example for misrepresentation by them, when it comes to scientific publications and data, and for conspiracy ideation. Brandon, Climategate will be the trump card until the AGW enterprise has shown it’s cleaned house. Another vague requirement. What constitutes “cleaning house”? I’m not arguing that there was no MWP. As if a major settlement can be sustained over hundreds of years by marketing. Now we’re down to what “major settlement” means. The ancestors of Greenlandic Inuit were there from ~2500 thousand years BCE and stayed through the LIA well after the Norse decided to heck with it and packed it in. My point is that there are better temperature proxies than “Greenland was green” catchphrases. I’ve already posted the links to the time series for Mann 2009 and Moberg 2005. Why does the method of procurement have anything to do with the seriousness of the revelations? Nothing, but I like it as a rhetorical device. Why haven’t all the various boards of inquiry which have been done over the years not settled your view of the “seriousness” of the revelations? Sounds like an attempt at distraction. Bringing Climategate up with me when I’m asking Briggs one simple question that neither he or anyone else here has answered is the distraction. It’s the get out of jail free card when contrarians are pretending to do science but are really doing rhetoric and a warmie calls them on it. If climate were that predictable, we wouldn’t need models and this whole discussion would be moot. This is a debate not an inquisition. Oh that is just irony of the sweetest sort. Well done. But tell you what, I’ll decide how to prosecute my arguments, and Briggs will decide if I’m to be allowed to continue doing it. Or he could just answer the question. It’s really quite simple. Brandon, the reason that Climategate is important is that it is evidence that there is a rotten apple (or more) in the barrel, and that the rot spreads, as shown by Booker’s article (the alteration of temperature data from Paraguayan stations) and the attempt to get Soon fired from his job. It is also evidence that a cornerstone of the AGW proposal–the hockey stick formulation–is seriously flawed, both in execution and conception. I’m not going to explain anything, since I don’t have the burden of disproving the “truth” of your, Booker’s, or Homeland’s assertions about alleged fudging of temperature data that are put forward in newspapers or some opinion blogs. One of the MOs of fake skeptics is that they are making mere assertions, allegations, and accusations, and then they demand that others must disprove those. The fact that you are following the same MO is evidence that you don’t know what a rational discourse is, actually, which you are demanding. The methodologies with which the temperature analyses are done, including homogenization and other adjustments (e.g., for the urban island heat effect), which are scientifically required to minimize non-climatic effects on the temperature analyses have been published in the peer-reviewed scientific literature, i.e., they have been under the scrutiny of the scientific community. Unless you have to offer some equally peer-reviewed scientific studies, which have come to the conclusion that those analyses are severely faulty, lead to significantly erroneous results, and the correction of those would alter the conclusions, you have got nothing. This is hilarious, since you are the one who is relying on dubious claims made by a dubious person in some newspaper to make your assertions. My knowledge of science is indeed based on working in the field and on reading the scientific literature. Yours, in contrast, is very likely not. So, why would anyone present the graph from the FAR in 1990 as something that represented the historic temperature record better than the actual reconstructions based on proxy data, if one is interested in advancing our knowledge, based on more data? Best I can figure is that they latch onto the answer they like best and stick with it. Which is odd because while MBH98 has a decidedly different shape from the FAR illustration, the Moberg (2005) reconstruction has a decidedly pronounced MWP leading into an LIA quite similar to the 1990 diagram. We could be having interesting discussions why the difference between that study and Mann (2009), but instead I’m getting peppered with questions about stolen emails. Nobody’s discussing model skill except to complain that I’m curiously fixated on it, and I note that the bulk of your pointed questions are being dodged and evaded in similar fashion. It doesn’t look like proper scientific skepticism to me at all. And what comes out of the Climategate revelations leads one (this one at least, a physicist, used to hard science) to skepticism about the utility of computer models for something as complicated as climate. There is computer modeling for other “unknowable” processes in science–for example, for the evolution of the universe. It’s interesting, but the model results aren’t used to change public policy. Yet despite all the fiddling with Paraguay, which required no FOIA or theft of any kind to “uncover” we still have nearly two decades Great Pause and models which don’t march in lockstep to the allegedly fudged “observations”. Apparently that rot isn’t spreading quick enough for us. We’ll get right on that. I assume that this is a typo and that you do not mean 2.5 million years. The Norsemen did not encounter any Inuit when they first settled in Greenland. They appeared and moved in at the point when the Norsemen left. The Norsemen left because they could, whereas the Inuit were stuck and also genetically adapted to the cold. Even today you do not see many Inuit in the south because of the discomfort of the warmer climes. Despite this there is a limit to cold toleration and during the little ice age the Inuit did move away from the high Arctic into southern Labrador and southern Greenland. Is this an admission of intellectual dishonesty? What have you called us on exactly? What argument would that be? As an aside Briggs rarely bans anyone. He is much more tolerant than I would be under like circumstances. I can only remember one case where he did ban someone and that person was way over the top with foul language. Even then the offender was given a number of warnings. Also I should note that his person was a warmist as well. Curious that. Your stubborn insistence on getting your way and your petulance leaves no reason for dialogue with you, Brandon. Who can blame Briggs for shining you on. I will follow his lead. 2500 BCE is what I meant. Migrations of those populations is complex. That the Norse could hack it in Greenland during the MWP doesn’t mean that it was tropical. And you are still missing the point that I’m not contesting the existence of the MWP, only pointing out that there are better ways of estimating global temperatures than quoting old Norse Real-Estate brochures. I think we really should be done here. lol. I gave you a bluntly truthful answer and you’re still flailing around trying to paint me out to be a liar. Desperation is a stinky cologne. That Briggs “assessment” of model skill is crap if he doesn’t actually do the calculations. The deer-in-the-headlights act doesn’t suit you. The English name is badgering. Latin for badger is taxus. So it must be taxusing. You’ve definitely got Briggs’ knack for spin, evasion and misdirection down pat. That little jibe about “being a little harsh in questioning his right to express his opinion” was an especially nice touch. Subtle enough that I missed it my first pass, but on review a bit more bluntly overt than he’d normally manage. Thing you must work on if he’s to be your role-model though is that he doesn’t (that I’ve seen) tell someone he’s going to ignore them, he just does it. Implied disdain is ever so much better than forced expressions of it. Not always easy to do, I’d know. Cheers. to Brandon: I would not be so excised about the efforts to promote AGW if wasn’t for the warmist academics having gotten into bed with politicians and thereby engendering offspring that have done and will do much harm to this country: edicts that make coal miners and workers in coal fired utility plants lose their jobs, lost billions to worthless solar energy companies that go bankrupt, the blight of windmills on the landscape, killing birds, the diversion of research funds to worthless endeavours. The worst harm the warmists have done is to entwine (more than had been done already) science and politics, for the use of statist politicians. You are a whiner, Brandon. And you can’t engage in a discussion without getting pissed off and descending into pettifoggery. I said I was going to shine you on. That is not the same as ignoring. It means I am brushing you off. I can do it quickly, or slowly. We will see how much you can take. Keep demanding that Dr. Briggs pay attention to you and give you what you want. It’s amusing. And you have decided that I am his son, so you won’t answer my question. What a hoot. What is that called, the associative property of not answering questions? He doesn’t have a clue. I’m not sure what it is that you expect in the way of discussion. With comments like the following I can only grasp at straws. These comments are not the act of a man who wants a debate but are those of one who throws mud hoping something will stick. The MWP keeps coming up because even though you admit its existence you are clearly trying to downplay it. The links that you gave are just pictures (graphs) and sort of like the cartoon that you disparaged. At least have the respect to give us a scientific article. Never ask another to do what you cannot do yourself. Show us don’t tell us. Badgering, yes that is it. Thanks. A legal term I believe which reminds me of another “falsus in uno, falsus in omnibus” which I think applies to the current shenanigans about temperature records. I know that you’re excised about this because you don’t agree with the proposed solutions. I’m excised because I’d rather either debate the science on the merits of the arguments in the literature, or debate the policy proposals. Instead there’s this unending cycle of mishmashed science mixed with politics, and I’m really beyond tired of my side getting hammered for being the only one doing it. It pisses me off at good, intelligent people that would otherwise be likable if they weren’t so stupidly pig-headed all the time. I know you know the feeling. But. That’s the way the world works. I wouldn’t expect a major policy issue like AGW to not be highly politicized. Academia has its own internal politics regardless. It’s competitive. There’s peer-pressure. Ideological motivations. Confirmation bias. Downright dirty rotten cheating just to get the thing into an influential journal so that the ever-tighter pool grant money keeps coming. I know this happens. In all sciences. Been going on a long time too. No cheating while I was doing science (up to 1995). And even if that history were true, that’s not an excuse for cheating. “A successful model will make verifiable novel predictions. All your arguments are charmingly circular. You feel the only important metric is model forecasting skill score. Why? Because you say so. So you ask the wrong question over and over again, and when you’re given correct answers to your questions, you hand wave them all away. Because it’s not the answer you wanted, because you say so. It’s a silly game to play. I find your response to my comment puzzling because I 100% agree with it, and it was the same point I was making in response to the claim you were making. Which you’ve either now disown, or perhaps you had some other position which you failed to present clearly or I failed to interpret successfully. Now, here is where we differ. I’m not interested in whether a test is “fair” to our poor models. What we want to do scientifically, and for public policy purposes, is to establish if a model is fit for the purpose to which it is being put. IPCC climate models are presented to the public, to the scientific community, and to policy makers, as tools that can predict short term (decadal), mid term (multi-decadal) and long term (century based) changes in global temperature. Now, we can use *any* sensible test we want, to establish how good they are *at those tasks. * There is little point in acting like a petulant child and declaring all these different tests that models fail are ‘unfair’ to the model because you or Brandon present an a priori argument that no model can pass such tests. As I said before, I’m happy to accept your claims for the sake of the argument. But the implications of your argument is that no climate model can be used in the way they are currently being used. (Short, medium, long term prediction). If that’s true, then the faster Mr Brigg’s et al., make this point clear to the world, the better. Well then I guess we know for sure you didn’t work in a climate lab. But Pons and Fleischmann? Gah! Hasn’t Briggs ever delivered a lecture about the hazards drawing overly-certain conclusions from very small sample sizes? Brandon, I’m not sure how familiar you are with the original electrochemical experiment of Pons and Fleishman. They didn’t “cheat”–they didn’t fudge data. They misinterpreted thermal changes upon electrolysis as due to cold fusion without properly accounting for all sources of heating and experimental error. That’s error, which was corrected in subsequent attempts to replicate the experiment (which is the great thing about true, hard science–you can test experimental results to see if they’re reproducible). So, again I disagree with you. It’s getting to be a habit! A good article on this general topic at WUWT. They misinterpreted thermal changes upon electrolysis as due to cold fusion without properly accounting for all sources of heating and experimental error. Story I read was that they actually did fudge data which didn’t come out until about a year or so after the replication experiments came up negative. Last I saw, which was years ago, they got funded overseas somewhere and were still at it. I probably shouldn’t believe everything I read on the Internet though. That’s error, which was corrected in subsequent attempts to replicate the experiment (which is the great thing about true, hard science–you can test experimental results to see if they’re reproducible). I grant that it probably helps out with the measurements when the experiment fits on a lab bench. Haven’t read that one yet. Will be interesting to read the comments because even though Anthony banned the Sky Dragon Slayers from WUWT, there’s still a pretty strong contingent over there which all but completely rejects any form of GHG warming effects. You feel the only important metric is model forecasting skill score. Why? I’m not sure what it is that you expect in the way of discussion. I don’t expect a discussion, I expect bad faith “debate”. I’ll hazard a guess expect the exact same from my side of the aisle. These comments are not the act of a man who wants a debate but are those of one who throws mud hoping something will stick. Point of order: what I want and what I expect are two different things entirely. The MWP keeps coming up because even though you admit its existence you are clearly trying to downplay it. Nothing could be further from the truth. The supreme irony of the MWP is that it’s in my best interests to play it up. Wayyy up. Because then I can argue for larger feedback responses to external forcings and THAT makes CO2 more potent. Which makes the spectre of methane clathrate explosions a little easier to sell. Which means I get to take your fossil fuels away from you post-haste and send you back to the stone age where I want you instead of phasing them out in a carefully planned, rational, non-panicky, economically feasible fashion with minimal quality of life disruption — or maybe if people would learn how to work with each other better, a chance at near- to mid-term improvements in quality of life. Call that last concept “proactive adaptation”. The links that you gave are just pictures (graphs) and sort of like the cartoon that you disparaged. If you don’t know the difference between a cartoon and peer-reviewed literature I … well I’m uncharacteristically at a loss for words. At least have the respect to give us a scientific article. Second one is abstract-only, I can’t recall if there’s an open-access full version floating around out there or not. You do realize that you have just asked me to do something that you can do for yourself. Don’t you? I adamantly refuse to answer Briggs’ questions for him, but I am willing to show you where to get the data for you to do your own analysis if you really don’t know where it lives. CMIP5 ensemble data here: http://climexp.knmi.nl/cmip5_indices.cgi?id=someone@somewhere I’d start with one of the multi-model means, doesn’t really matter which RCP for the historical part of the run. Brandon: I read the original Pons/Fleishman paper and papers that followed, attempting to replicate the results. I don’t think fudging the data entered into it. The same thing with the big fuss about polywater–not all experimental variables were accounted for. And you’re quite correct; it’s much easier to deal experimentally with benchtop experiments (even unto gigajoule accelerators) than climate or the universe. Which is why computer models for climate or cosmology are to be regarded with more than the usual skepticism. It says, “What happens next year is what happened this year”. GCMs can’t even beat that. Whose claim is this? A fair comparison between the above said naive prediction and any proper model would probably prove this statemt wrong! No I didn’t. Mr Brigg’s said that. For your reference he is the guy who wears the dashing fedora. I’m the guy that looks a little like a younger version of George Clooney. You can evaluate a model’s skill using many different criteria depending on which question you’re asking. You might ask the question: Is this a good model based on what we can reasonably expect from the design of this model and what it’s modelling? Or you can ask a more relevant question: Is this a model that is good at making short, mid and long term predictions? Is it fit for the purpose to which it is being put? Note the difference. Is it a good model versus is it being used or misused? The first question I have not commented on, as I don’t consider it crucial in any sense. But that doesn’t mean it’s irrelevant or not important, depending on the question you’re asking. The important question is the 2nd one. Your habit of conflating the two questions, though, is starting to come across as rhetorical bravado. I don’t think fudging the data entered into it. I get that. I’m agnostic to whether or not they did because my memory is that I read about it in some muck-raking MSM rag. This should begin to sound familiar, all except the being undecided portion that is. And you’re quite correct; it’s much easier to deal experimentally with benchtop experiments (even unto gigajoule accelerators) than climate or the universe. Must be near quitting time because I wrote something you agreed with. Which is why computer models for climate or cosmology are to be regarded with more than the usual skepticism. Dang, that’s two agrees in a row. Hard to know when you are serious. In either case you are one scary dude. Not really. I have no idea what you think should be done. That is why I keep asking. No I didn’t. Mr Brigg’s said that. My reply is, don’t ask me, ask to Briggs. He’s the one who brought it up. You can evaluate a model’s skill using many different criteria depending on which question you’re asking. You might ask the question: Is this a good model based on what we can reasonably expect from the design of this model and what it’s modelling? Or you can ask a more relevant question: Is this a model that is good at making short, mid and long term predictions? Is it fit for the purpose to which it is being put? I couldn’t have asked that third question better myself. I’ve got another one: Is its performance being evaluated according to its published design and intended use? Your habit of conflating the two questions, though, is starting to come across as rhetorical bravado. If I’ve conflated those two things, you’ll need to quote me directly for me to understand what you’re referring to. You linked to a picture, not peer reviewed literature. You know that don’t you? As a peer reviewer myself the word has a lot less magic then it does for you. OK, well if you’re agreeing with everything I wrote, I’d say that doesn’t leave us any room to discuss points of departure. Hard to know when you are serious. In either case you are one scary dude. I don’t want to take our fossil fuels away tomorrow. I don’t want to take them away ever. Best case scenario is that we all voluntarily decide to wean ourselves off them on a reasonable schedule and replace them with something else as we go so that there are minimal service interruptions or price shocks. Not likely gonna happen, unfortunately. I have no idea what you think should be done. That is why I keep asking. Argh! I think that when Briggs writes a statement like “the models are not skillful” he needs to provide some specifics about what that actually means. There are other issues as well. That stuff is between me and him. What’s between you and me is that you want me to do my own analysis and post it. No. Not on this thread while my questions to Briggs remain open. So I did what I thought was the next best thing; point you to where you can get the model and temperature data and roll your own. Do with that what you will. It’s your data; you paid for it and it’s free for you to access and use how you see fit. There was a disconnect somewhere along the line. I’m conflating something in your view, so I was expecting you to provide me with a direct quote of what I said which demonstrates the conflation. So I’d start there and we might wind our way back from there. You linked to a picture, not peer reviewed literature. You know that don’t you? I linked to pictures that are the product of peer-reviewed literature. I’ve provided you the direct citations to the papers those data come from. Why are we still discussing who did what when, and not discussing the literature itself? As a peer reviewer myself the word has a lot less magic then it does for you. I’d dearly love to know how it is you come by the exact thoughts inside my head. there’s a footnote to that post that explains my position and my own experiences with the peer-review process, which is quite contrary to that propounded by warmist academics. More smear distributed by Kurland against scientists that they were “cheating”. The fact alone that adjustments are being made to the raw data is not evidence for “cheating”. The scientific justification for the adjustments has been laid out in the peer-reviewed literature. And nothing is hidden by NOAA. What effects the adjustments have for each individual station can all be found at the NOAA website. No Paul Homewood needed to “discover” that. I would think that some evil conspiracy would try to hide this better. one wonders why any scientist would go through all the effort to “fudge” the data from stations all over the world, even though it doesn’t make any difference about the conclusions regarding the reality of global surface warming, considering the risk for reputation, professional career and livelihood, which would come for the scientists who did the “cheating”. What would be the gain for the scientists from such doing? Depends how you define “cheating”. Do you prefer ‘self serving confirmation bias’ ? I’d say it does make a huge difference because slight cooling or even no warming is rhetorically important. The public are ignorant of this topic, so if they are told the planet is warming this is sufficient to keep the pressure lid on. They don’t understand that the recent warming rate is basically equal to zero. This sort of thing happens all the time among groups of experts. You’d be hard pressed to find situations where personal interest wasn’t a factor. Investment advisers tend to advise their clients about investments they make commissions on. Doctors tend to recommend useless medical procedures that are relatively simple and relatively safe, that they can profit from. Why is anyone surprised by such practices? Unless you have sort of romantic ideal of scientists being morally superior to the rest of us. And the term “experiment” applies to data reporting and computer programming. The title of this article is “Natural Variations In Weather DO NOT Explain The ‘Pause'”. I agree; that’s magical thinking. Here’s the thing: Climategate doesn’t explain the “Hiatus” either. I notice you continued to misunderstand. Is that on purpose?? The model the casino uses does NOT include the extra data you gain from card counting. Try using a new deck for each hand and you approach their model. Still, because few people have the ability, or soberness, or cash to card count effectively enough they didn’t worry about it until the few who could were using the additional data model to hurt their bottom line. Oh, do you deny the adjustments of the temp records have consistently made the surface records closer to the models rather than adjusting the poor models to match the observations?? Thanks for a great post. Climates cycle, not a smooth sign wave but an irregular cycle based on the interaction of oceans and atmosphere and the only input, the sun. We are currently at the top of a cycle and since the cycles are very slow the temperature appears flat. We need a pile more data before any meaningful conclusion can be drawn.